This Bio battery tutorial covers Bio battery basics including construction, working and applications. It mentions Bio-battery advantages and Bio-battery disadvantages.It mentions types of bio-battery. 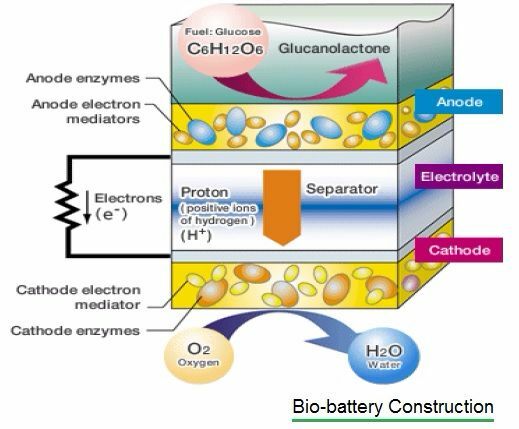 The figure-1 depicts construction of Bio battery. As shown it consists of anode, cathode, electrolyte and separator. All the components are layered on top of the other layers. The anode is negative and it is located on top of battery. The cathode is positive and is located on bottom. Electrons enter into the battery from anode terminal and Currents flow out from the battery from cathode terminal. Electrolyte is present between the anode and cathode. It has separator which is used to keep anode and cathode separate to each other in order to avoid any short circuit. Bio-battery is different than conventional battery. Here biological enzymes are used for anode and cathode as catalysts. Enzymes and electronic mediators are fixed on both cathode and anode terminals. The figure-2 depicts working of Bio battery. The system is designed such that it allows flow of electrons and protons. This will generate electricity. Movement of ptotons occurs due to moving force. This movement is known as current. Flow of electrons happen from anode to cathode and current will flow from cathode to anode. • As shown glucose is used on anode side and enzyme on cathode side. • Glucose gets broken into protons(H+) and electrons(e-). • The protons move to cathode side through separator and electrons move to cathode side through mediator. • Enzymes are used at cathode which produces water using both electrons and protons transported from anode part. Oxygen reduction reaction is being applied here. • Above reactions will create electrons (e-) and protons (H+) in the system. As a result of this, electric energy is generated. Based on types of agents which are involved in the breakdown of substrate following are the two main types of Bio battery. We know that breakdown of substrate produces protons as well as electrons. This results into generation of electricity. • Enzymatic Bio-Battery: Enzymes (Biochemical agents) are used for breakdown of substrate. • Microbial Bio-Battery: Micro-organisms (electric bacteria, escherichia coli etc.) are used for breakdown of substrate. Other types of Bio-battery include cellulose based bio-batteries, body fluid based bio-batteries etc. • It allows instant recharge compare to all the other batteries. • These batteries keep themselves charged with the help of continuous supply of glucose or sugar. They do not require any external power supply. • It can be made using readily available fuel. • It has high energy density. • It can be used easily at room tempearture. • The flexible paper prototype is used as implantable power source. • They are used as clean alternate re-newable power source due to the fact that they are source of non-toxic and non-flammable fuel. • They do not cause any explosions. Hence they are safe to use. • They do not cause any leakage. • They are less likely to retain most of their energy compare to conventional batteries e.g. lithium based. • They are not suitable for long term usage and storage. • Used as portable charging in cell phones, soldier power etc. • Used in medical implants e.g. pace makers, insulin pumps etc. • Used in disaster relief e.g. generators, remote power etc. • It is also used in toys and greeting cards. This Bio battery tutorial is useful for beginners as well as advanced enthusiasts.